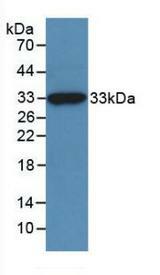 Beta-N-Acetylglucosaminidase antibody LS-C690020 is an FITC-conjugated rabbit polyclonal antibody to human Beta-N-Acetylglucosaminidase. Validated for IHC and WB. Recombinant NAGase (Ser6-Lys240) expressed in E. coli. 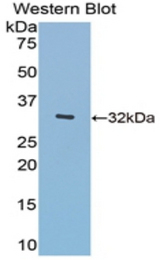 Western Blot; Sample: Recombinant NAGase, Human.